Its the last morning at Moab before we head to Torrey. We revisit Arches National Park to catch a couple of spots that we missed last night. The sun is bright so we don’t get the play of colors that sunset and twilight brings, but the views are still pretty spectacular. There isn’t time to do any trails unfortunately so we do a drive through Fiery Furnace and Devil’s Garden. We have a busy day ahead of us in Moab! 2 national parks to see today – Canyonlands and Arches National Park, as well as some shopping to do in the afternoon. We wake up to a wonderful sunrise in Monument Valley. I head out to take in the air and the beautiful sights. We wake up in Page to see the sunrise in the desert. Relatively not a lot to see where our hotel is but its nice to watch the colors change. I seem to have caught some bug since I had a fever and cold last night. I have to go to the desert to get a cold, yikes. Its our final morning at the lodge so we woke up early to catch the sunrise. Here are some more pics. Left Boston yesterday flying to Las Vegas and then drove to Springdale, UT where we are staying overnight to check out Zion National Park. I’ve never really travelled through desert country and the terrain and sights are spectacular. Will post some pics and notes from the trip as we go along, internet availability permitting. Great advice from master musician Kenny Werner. “Moving slow enough for the hands to feel like they are aware of where to go next. This sets up a platform for one to increase the speed the next time around. Because one is moving slow enough to to program the hands to know… and to remember which finger goes where without one having to remind them. Intresting chart comparing how many copies of an album an artist would need to sell via various online distribution companies to make the minimum US monthly wage of $1160. How Much Do Music Artists Earn Online? DownBeat puts ‘One Of Us’ in the HotBox! The album is featured in the May issue of DownBeat magazine in the section called ‘The HotBox’, a somewhat infamous column where four albums are selected each month for review by four DownBeat reviewers. It’s a pretty tough crowd and reviews can be scorching at times, so when Ramona got a call from the magazine editor recently asking her to send copies of the CD for review in Hot Box, there were some mixed feelings! The May issue is available on newstands now. We were happy to learn that the album received a 3 1/2 star review (out of 5). By HotBox standards, that’s actually an excellent review! We grew up with DownBeat magazine and have learned so much from it, so it’s a milestone to be featured there. I’ve uploaded some very nice live recordings of Ramona’s trio from some older gigs at Les Zygomates in Boston. They were all recorded on a Zoom H4 field recorder and I mastered them using Izotope Alloy and Ozone. Great band and I think the recordings sound pretty nice. Click here to download them for free. It features the trio primarily playing her arrangements of some great jazz standards. There are two video’s now posted of the Ramona Borthwick Quintet from our recent CD release concert. It’s an amateur recording but the results were not too bad. Audio was recorded on a Zoom H4 field recorder from the audience perspective. Video footage was provided by two cameras, one static and one mobile. I had taken my Canon HF10 to the gig but found that the LCD had broken earlier, so I was unable to use it at the gig! 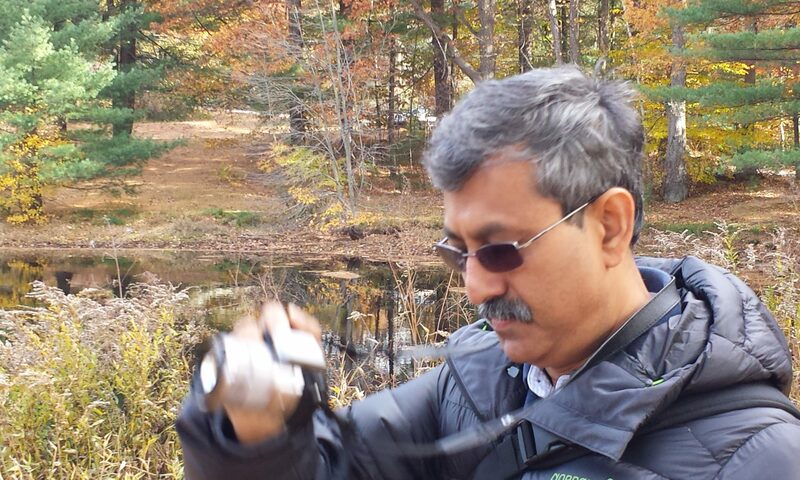 Thanks to Dan Abreu for doing the video with his cameras and Dave Malaguti for the audio recording. Anyway here are two video’s. Enjoy! 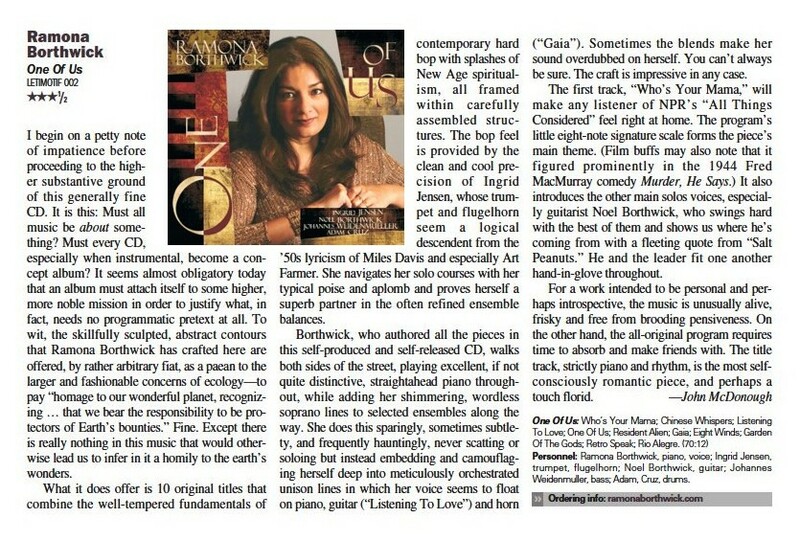 A nice review of ‘One Of Us’ was posted to All About Jazz today by editor Raul d’Gama Rose.